Connect your iPad (iPhone) to your computer using the provided Dock Connector via USB cable. Select your iPad (iPhone) in iTunes. Under the File Sharing section, you'll find a list of apps currently installed on your iPad device that support File Sharing. 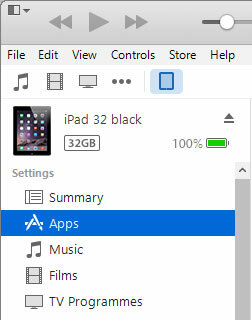 Select tiReader to view a list of the files on your iPad (iPhone) associated with the App. Drag and drop folders / files onto the Documents list to copy them to the App on your iPad. Or click the «Add File…» button and select files on your computer. The selected files will be copied immediately to the App on your iPad. When you import a folder, after refresh the tiReader Library, the folder (and all its files and subfolders) will be imported to the tiReader Library. For all newly downloaded folders / files the attribute «NEW» will be set automatically. All root folders of the Library are displayed in the App folder (available through iTunes). Select Library folder / files in the iTunes App folder and click «Save to…».